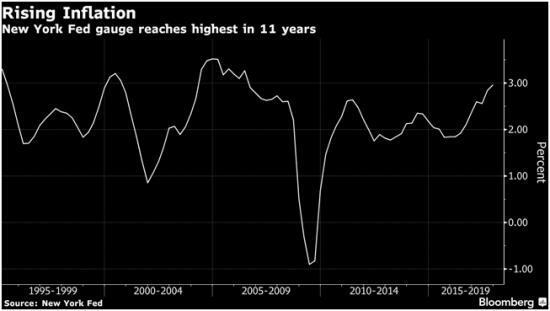 Central bankers keep lamenting the fact that record low interest rates and record high currency creation haven’t generated enough inflation (because remember, for these guys inflation is a good thing rather than a dangerous disease). Well it appears that someone at the Fed has finally decided to see what would happen if the CPI included those assets, and surprise! the result is inflation of 3%, or half again as high as the Fed’s target rate. (Bloomberg) – More than 20 years ago, former Fed Chairman Alan Greenspan asked an important question “what prices are important for the conduct of monetary policy?” The query was directly related to asset prices and whether their stability was essential for economic stability and good performance. No one has ever offered a coherent answer even though the recessions of 2001 and 2008-2009 were primarily due to a sharp correction in asset prices. A new underlying inflation gauge, or UIG, created by the staff of the New York Fed may finally provide the answer. Its broad-based measure of inflation includes consumer and producer prices, commodity prices and real and financial asset prices. The New York Fed staff concluded that the new inflation gauge detects cyclical turning points in underlying inflation and has a better track record than the consumer price series. The latest reading shows inflation of almost 3 percent for the past 12 months, compared with 1.8 percent for the consumer price index and 1.8 percent for core consumer prices, which exclude food and energy. Since the broad-based UIG is advancing 100 basis points above CPI, it indicates that asset prices are large, persistent and reflect too easy monetary policy. The UIG carries three important messages to policy makers: the obsessive fears of economy-wide inflation being too low is misguided; monetary stimulus in recent years was not needed; and, the path to normalizing official rates is too slow and the intended level is too low. To summarize, a true measure of inflation – one that is highly correlated with the business cycle – is not only above the Fed’s target but accelerating. Note on the above chart that both times this happened in the past a recession and bear market followed shortly. The really frustrating part of this story is that had central banks viewed stocks, bonds and real estate as part of the “cost of living” all along, the past three decades’ booms and busts might have been avoided because monetary policy would have tightened several years earlier, moderating each cycle’s volatility. But it’s too late to moderate anything this time around. Asset prices have been allowed to soar to levels that put huge air pockets under them in the next downturn. Here’s a chart that illustrates both the repeating nature of today’s bubble and its immensity. In other words, it is different this time — it’s much worse.